re: The Auditors » Blog Archive » PCAOB’s Franzel Speaks to AAA; Are Auditors’ ICFR Opinions Just “Busy-Work”? On Friday at MarketWatch I gave readers a little preview of a speech PCAOB member Jeanette Franzel gave at an all day COSO workshop on Saturday at the AAA Annual Meeting in Chicago. I wanted to reiterate what I read and what some of you heard and add a bit more for emphasis. This is important analysis by the PCAOB and vitally important information for investors and those in a policy and regulatory role. You should shudder over the sheer nonsense of it all. Franzel’s speech on Saturday at the American Accounting Association annual meeting, in part, responds to criticisms made by the U.S. Chamber of Commerce in May that I wrote about previously. In a letter to the Securities and Exchange Commission and the Public Company Accounting Oversight Board, the Chamber complained about unintended consequences of the PCAOB auditor inspection process that Chamber members believe are imposing new “burdens” on business. The Chamber called on the SEC and PCAOB to meet with its members to discuss their concerns. The Chamber thinks that the ICFR work has gotten out of hand and is costing companies more money with little to show for it. Franzel, in her speech, says that PCAOB research concludes that fees are not higher without good reason for it. I was sadly not surprised to hear that material misstatements and restatements did not match up with adverse opinions on ICFR. The PCAOB began putting significant focus and emphasis on audits of ICFR in its 2010 inspections—a focus that has continued since then. When looking more specifically at the companies with financial restatements, the data show additional complexity. The vast majority of companies restating prior year financial statements received a “clean” audit opinion on ICFR in the year in which the restatement was announced. 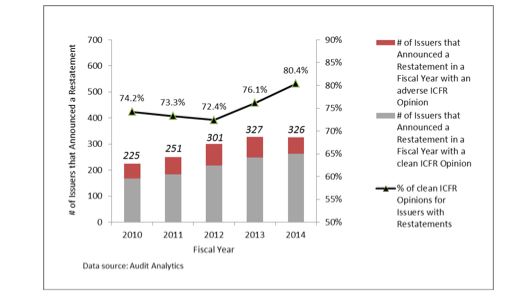 Figure 3 below shows that in 2014, more than 80 percent of such restating companies received an ICFR opinion from their auditor that their ICFR was effective in the year that the restatement was announced. This reflects an increase over recent years. This data shows that often a material weakness is not identified even when a known misstatement occurs, and suggests that there may be undisclosed material weaknesses in ICFR. Source: Audit Analytics. The number of announcements of a restatement made by issuers presented in Figure 2 includes non-reliance notifications filed by an issuer on Form 8-K and disclosure of a restatement identified in the issuers’ periodic filing. Some academic research, although based on data from earlier years, seems to support this observation. See, e.g., Rice, Sarah C., and David P. Weber, “How Effective is Internal Control Reporting Under SOX 404? Determinants of the (Non‐) Disclosure of Existing Material Weaknesses,” Journal of Accounting Research 50.3 (2012): 811-843. But what I did not know is that auditors actually went back and revised those blown ICFR opinions to cross their “Ts” and dot their “i”s and basically paper over their mistakes, their audit failures. A restatement of a clean ICFR audit opinion happens when, subsequent to the issuance of the ICFR audit opinion, the following two conditions occur: (1) the auditor becomes aware that one or more material weakness existed at the report date that would have affected the auditor’s opinion on ICFR had the auditor been aware of it; and (2) the previously issued ICFR audit opinion is being relied upon. Because the ICFR opinions are issued annually, this “reliance period” is generally from the date the opinion is issued until the date of the issuance of the subsequent year’s ICFR audit opinion. Try to wrap your head around that. The tail is wagging the dog. Of what possible use to the average, even the sophisticated, investor is a restated ICFR opinion by an auditor that is good for less than a year? It’s clearly just a whitewash by the firm to limit the ability of anyone but the sharpest observer to catch their error and call them on it with a lawsuit or some other negative consequence. When I spoke to Franzel she said that, although it may not be obvious that a firm has suffered any consequences of such a major failure, rest assured, she assured me, individual partners do hear about it. That’s one more reason why it would be really nice to know who the heck these lead engagement and quality assurance partners are on these engagements and whether or not they actually incurred any firm level or regulator level disciplinary action for their failures. There’s no transparency about whether or not the system is working and incompetents are being flushed out. There are some proposals about this out there, right? For example, what about the lead engagement partner and quality assurance partner on JP Morgan’s audit at PwC? You may recall I wrote at Forbes that the bank did actually admit to a material weakness in internal controls over financial reporting for its “Whale” trade losses in 2012. On July 13, 2012, JPMorgan management, not PwC the auditors, reported that a material weakness existed in its internal control over financial reporting as of March 31, 2012. The bank had finally acknowledged that the valuation controls for the synthetic credit portfolio managed by CIO were broken. Management also concluded that its disclosure controls and procedures were ineffective at March 31, 2012. First quarter 2012 results were formally restated, resulting in an additional loss of $459 million. 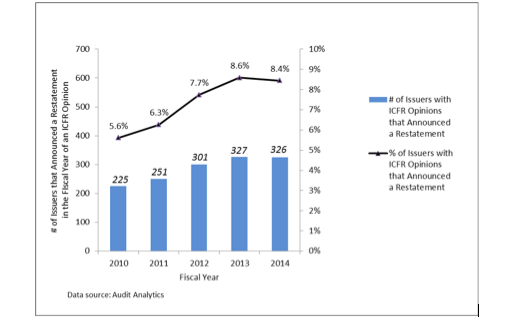 JPM received a clean opinion on ICFR at year-end 2011 and then again at year-end 2012. How can that happen? By the way, the SEC, although it did join in an enforcement order/settlement with JP Morgan for the “Whale” fiasco, and did mention Sarbanes-Oxley in that order, it did not actually cite the bank for any Sarbanes-Oxley violations. In particular, although there was an actual restatement for a material error based on misconduct with an 8-K and everything including correction of prior period data, the SEC never insisted upon CEO and CFO incentive comp clawbacks under Section 304. All this corporate executive worry about the new Dodd-Frank clawback proposed rule is unfortunately just theatrics. It not only is an impotent rule based on its huge loophole for “stealth” restatements but it is as unlikely to be enforced against any big shots as the SOx version was.